An open source solution for industrial vision. Graphically solve vision problems with a HTML5 frontend and deploy the solution on a high performance runtime system. Stromx-web is a visual frontend to design and edit solutions for problems in industrial vision in your web browser. 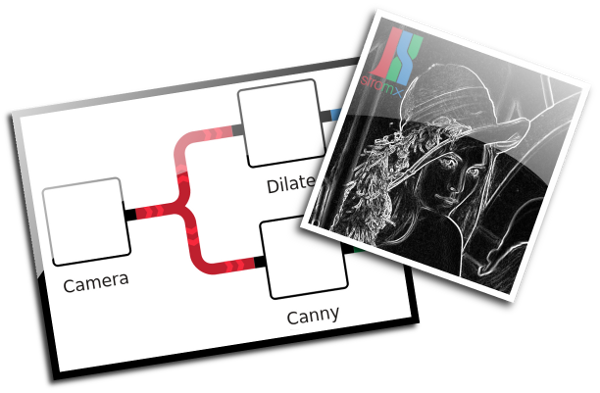 It allows to construct complex vision applications – called streams – by drag and drop. The effect of parameter changes can be observed in real-time while the stream is executing on the target system. Stromx streams are executed by the stromx C++ library. It provides an API to safely start and stop the execution of streams and to change the parameters of a running stream. The library is licensed under the permissive Apache 2.0 license which essentially allows to use it in closed source products without restrictions. Implement operators and data types using the stromx API. Your own operators can then be assembled and configured using stromx-web. Custom operators can be used to easily integrate vision algorithms, to access special hardware (industrial cameras, PLC,...) or to communicate with database systems. Operators for many functions of the OpenCV and the Raspberry Pi exist.